5 stars Head collar broke first time I used it, apparently they are meant to as they are so severe. Nonsense! Disappointed I had a loose horse and a chain in my hand! Had a new ring sent, very difficult to get the ring to close. Should have sent the head collar back. 5 stars Product: Brilliant - does exactly what it says on the box. Ordering online: Very easy. Thank you. Service: Excellent. Would happily recommend Equestrian Haus. 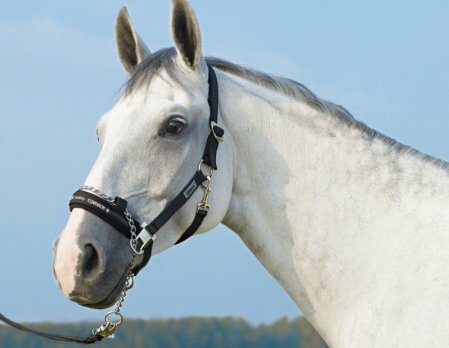 5 stars This headcollar is brilliant. Our 16.3hh Irish Draught has always been a bit of a nightmare to turn out, although beautifully mannered in every other way, turning him out he would just charge off never giving any warning of when he would go, but go he would with no hope of us holding him. With the new headcollar he now walks calmly beside us and we now actually get him into the field before letting him go. Wish we had had one of these years ago. Thank you.